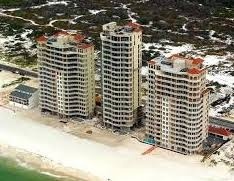 La Riva Condos are a beautiful condominium development in Perdido Key, Florida. With three Mediterranean-style inspired towers and a total of sixty-five units, La Riva attracts discriminating buyers who are looking for premier beachfront real estate in Perdido Key. La Riva condominiums are rent-restricted and feature very large floor plans, expansive views, and a high level of amenities. La Riva units were designed to be an opulent home away from home, and each unit has a residential feel to the living space. Contact The Gatti Team for more information about this luxurious waterfront condo development. Built between 2004 and 2005, La Riva Condos feature upscale amenities, with highlights including a mini-cinema, indoor and outdoor swimming facilities, sauna and hot tub, a spacious fitness room, gated entry with covered parking, owner’s lobbies, and over five hundred feet of sugar-sand beach right on your doorstep. Floor plans at La Riva start at just under 3,000 square feet, so there are no worries when friends and family drop by for a long weekend. Interior details are unique and elegant, and include solid custom cabinetry and doors, and high end kitchen appliances. Situated just steps from the entrance to Johnson’s Beach State Park, La Riva offers a location that lies adjacent to one of Florida’s most beautiful National Seashores. Nature lovers may picnic, fish, hike, swim, bike, and primitive camp here, and the Perdido Key Discovery Trail allows visitors to enjoy an elevated walking tour through the dunes, beach grasses, and birding habitats. Overall, La Riva condos boast top notch amenities and an unspoiled natural location with amazing views. To arrange a tour of La Riva condos, please call today!